JESUS, Lamb of God, worthy is your precious name. I lift you up and bless your Holy name. Father, you mean everything to me. Without you, I can’t do anything. You are my King, the ruler of everything and none can compare to you. You are my heart’s desire, Oh Lord. I give you my mind, body and soul. I want to be so lost in your presence that I can’t even begin to comprehend what’s happening. I hunger and thirst for you. Be my guide, Oh Lord and help me to be obedient to your Word. Help those who are disobedient to find you, Oh Lord and forgive them, for they know not what they do. Give me wisdom where I lack knowledge, so I can understand how to trust and obey. Proverbs 4:10-12 Hear, O my son, and receive my sayings; and the years of your life shall be many. I have taught you in the way of wisdom; I have led you in right paths. When you go, your steps shall not be straight; and when thou run, you will not stumble. 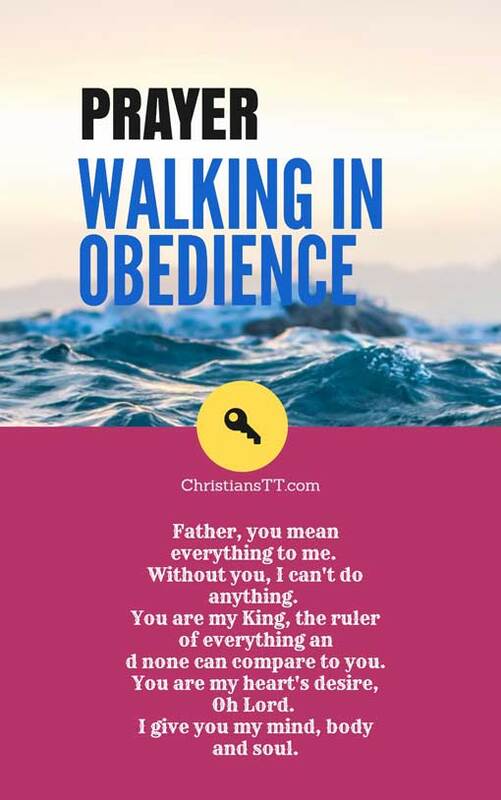 Lord, you made it clear that if I walk in obedience, I will live a full life with you. Being obedient will cause an overflow of abundant blessings within my life. Help me to not be as King Saul, for he lost everything through disobedience. Remind me, Oh Heavenly Father, that disobedience is a form of rebellion towards you and, as you have clearly stated, if I reject You and Your Word, you will reject me from your heavenly kingdom. 1 Samuel 15:22-23 So Samuel said: “Has the Lord as great delight in burnt offerings and sacrifices, as in obeying the voice of the Lord? Behold, to obey is better than sacrifice, and to heed than the fat of rams. For rebellion is as the sin of witchcraft, and stubbornness is as iniquity and idolatry. Because you have rejected the word of the Lord, He also has rejected you from being king.”. Jehovah-Raah, I know that Satan deliberately tempts me to disobey Your Word and Your calling upon my life. But, once we obey the deceiver, we lose out on your magnificent blessings. Obeying him who deceives, will only bring sorrow into our lives, oh God. Give me the strength to withstand all these temptations, for I know the blessings of you Lord makes rich and you add no sorrow with it. Help me to keep your words, and love you the way you deserve, honoring and glorifying your name. Help me to be like Jesus. I declare that obedience will fill my mind, heart and actions on this beautiful day and abundant blessings will rain down upon me. In Jesus’ mighty name, Amen! John 14:21-23 He who has My commandments and keeps them, it is he who loves Me. And he who loves Me will be loved by My Father, and I will love him and manifest Myself to him.” Judas (not Iscariot) said to Him, “Lord, how is it that You will manifest Yourself to us, and not to the world?” Jesus answered and said to him, “If anyone loves Me, he will keep My word; and My Father will love him, and We will come to him and make Our home with him.